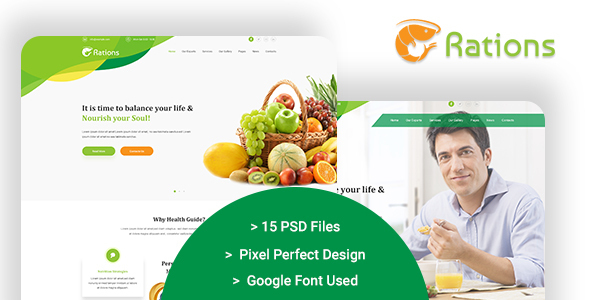 Ration is a unique PSD template especially designed for Diet & Nutrition Health Care related blog & affiliate website. This design is suitable for any kind of business like Diet & Nutrition, Dietitians, Health & Wellness, Sport & Weight Loss Programs and for Clinics/Centers that offer these kind of Services. Ration is clean design, responsive and well UX thinking template to promote your contents in the field of health niche. If you are looking for a design idea of health & weight loss related affiliate website or blog this template is best choice. Design:Ration has a very creative modern and uniqe design. It provides very neat & clean pages. 14+ identical sections and each section has designed with UX science to ensure the user accessibility. It’s very functional and has a convenient flavor. We give support for all our items. We try to answer all questions within 24 hours in weekdays. Support requests receive during weekends or public holidays will be processed on next Monday or the next business day. This entry was posted in health-beauty, psd-templates, retail and tagged care, Diet & Nutrition Template, Dietitians, Health & Nutrition Template, Health & Wellness, pricing table, ration, slider, Sport & Weight Loss Programs, template health, ui, ux, weight loss affiliate, white by dadmin. Bookmark the permalink.